My social media feeds are full of friends lamenting the suicide of Robin Williams and quoting their favourite films of his. The shock is obvious when you go through the list: every one involves Williams radiating energy, vitality. 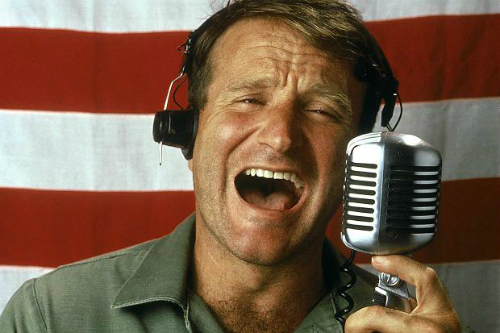 For me, it's Good Morning, Vietnam, where he is simply unleashed on screen and was the funniest thing I'd ever seen, so fast and so clever. That's what makes this news so horrible, the jarring contrast between the life (we should probably pronounce it "LIIIIIFFFFFFFFFE!!!!" as Williams' characters surely would) and death. It isn't ever natural; sudden, shocking deaths like this tell us that starkly. Death is an imposter, an enemy. Christianity faces up to this honestly but not without hope. The resurrection of Jesus from the dead is the start of a great defeat which will be accomplished by His inextinguishable Life. That's the only hope there is. "Then, when our dying bodies have been transformed into bodies that will never die, this Scripture will be fulfilled: 'Death is swallowed up in victory. O death, where is your victory? O death, where is your sting?' For sin is the sting that results in death, and the law gives sin its power. But thank God! He gives us victory over sin and death through our Lord Jesus Christ. So, my dear brothers and sisters, be strong and immovable. Always work enthusiastically for the Lord, for you know that nothing you do for the Lord is ever useless."